Climate change, depletion of natural resources, disappearance of biodiversity: we are daily beset by a flood of information about our near future. The apocalypse seems imminent, but the real stakes remain difficult to grasp. What are they really? The end of the planet? The extinction of our species, or, more concretely, the end of a way of life? What are our fears, our beliefs, our possibilities of action? Why do we seem paralyzed and unable to act, individually and collectively? The Pully Museum of Art and the Cantonal Museum of Geology join forces for a unique exhibition where scientific and artistic approaches enter into dialogue and enrich each other. Far from being opposed, the approaches of artists and researchers are complementary: the route of the exhibition, in both museums, allows an echo between these two spheres of activity. Thus, the visitor alternates between scientific critic and artistic interpretation, between reason and emotion. 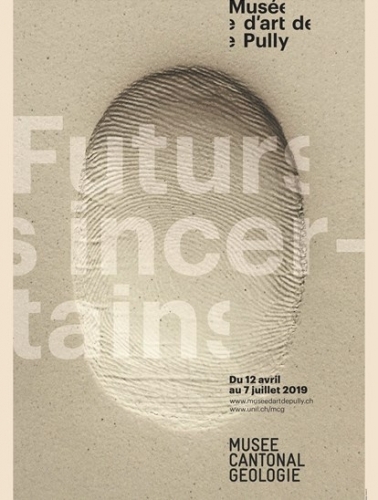 Philosopher of sciences, physicist of evolution, geologist, psychiatrist, climatologist and specialist of migratory flows express themselves and their remarks resonate with works and installations of contemporary artists who propose their vision of our world towards uncertain future.